Our regards for you. 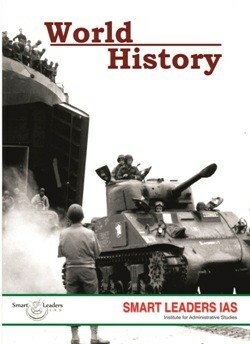 Yet again we are introducing a new book on WORLD HISTORY. This book covers all the topics mentioned in the UPSC syllabus. Care has been taken to compress the needed information and yet to give it in a lucid manner. This is a must read for the UPSC aspirants writing mains exam. We request you to kindly provide your suggestions to us, so that we can improve the next subsequent editions of the book. We congratulate the Smart Leaders IAS team who have taken great care to complete the book on time.